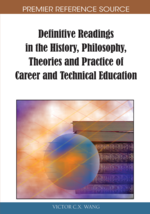 This chapter examines the history of career and technical education in the United States beginning with its earliest forms in the 16th and 17th centuries and continuing on through present-day society. Chronologically formatted, the primary focus is on how the nation’s domestic and international issues during each time period affected the development of vocational education, leading to major federal government legislation. Following a brief introduction of the subject, the background section will provide the reader with basic definitions of career and technical education as discussed by various authors, noting the changes of such definitions over the years. The main body of the chapter is divided into several sections based upon time periods. Each section will discuss national issues and major legislation reflecting changes in vocational education. Finally, the future of career and technical education will be examined, followed by a brief conclusion. Over the years, vocational education has gone through many changes in meaning and scope. In general, vocational education is characterized by teaching a skill or skills to students that will be useful in the workplace. However, this explanation does not satisfactorily describe the dimensions of vocational education, especially in how it is used in today’s society. A review of literature provides a wide variety of perspectives on the subject, as well as descriptions of vocational education as it has changed over time. F. J. Keller, a notable historian on this subject, looked at vocational education in a unique way. Instead of simply describing a method of educating students, Keller believed that vocational education was actually a way of living one’s life (Keller, 1948). He believed that vocational educators were charged not only with teaching specific skills, but also with teaching students how to live and act in the workplace and in society. He attributed the first form of vocational education, to monks, going as far back in history as the 7th century. Even before more structured forms of apprenticeships evolved, Keller claimed that monks were teaching each other the skills needed to conduct research and teach, along with necessary life lessons needed to live a productive life in the monastery (Keller, 1948). Eventually, the greater society began to see the benefits of this type of teaching, and apprenticeships became the common standard of passing on vital work skills to others during the colonial period of our nation’s history. Several authors have defined apprenticeships as forms of education where a master provides direct instruction of mastering a skill to a student, or apprentice (Barlow, 1974; Evans, 1971; Keller, 1948; Kneller, 1963; Miller, 1993). As discussed in future sections below, some masters expanded their teachings to include other basic educational components, such as reading and writing (Barlow, 1974; Kneller, 1963; Miller, 1993). Many apprenticeships, especially during this time period, also included room and board for the students (Barlow, 1974).